Join Boundless Journeys for Himalayan Kingdoms Hiking, an awe-inspiring adventure that combines the highlights of the Dragon Kingdom—Bhutan—with a five-day trek through the foothills of the Annapurna Mountains of Nepal. This is truly an epic journey through Himalayan landscapes, infused with mountain cultures, beautiful vistas, and a revitalizing trek amid the highest mountains in the world. Our flight into Bhutan provides spectacular views of the country's landscape as we approach the airport in the Paro Valley. The valley is a green bowl surrounded by jagged Himalayan Mountains and forested hillsides, crossed by beautiful rivers and dotted with medieval fortresses. The first thing we notice as we disembark in Bhutan is the absence of noise and a feeling of peacefulness rare in most other Asian cities. The Paro Valley has kept its bucolic nature, and is one of the most scenic valleys in Bhutan. The houses are considered to be among the most beautiful in the country, and Paro is believed to be one of the first valleys to have received the imprint of Buddhism in Bhutan. We are greeted with a warm Bhutanese reception and transferred to Thimphu, home of the royal family. Before becoming Bhutan's official national capital in 1961, Thimphu was a simple rural farming valley. Small and secluded, it is unlike any other capital in the world. The city is quiet, and there are still only a few streets with no traffic lights. Thimphu is a city ideally explored on foot, and our walk today takes us to many interesting sites. Before the day is through and if time allows, we may visit the National Textile Museum, the Thimphu Dzong (seat of the government and main monk body), the Heritage Museum and the Giant Buddha above town to give us some excellent views of the Thimpu Valley. 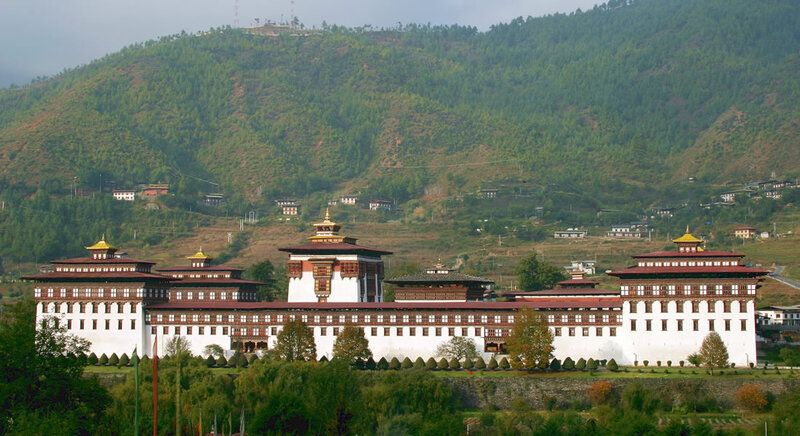 Bhutan's dzongs are perhaps the most visibly striking aspect of the kingdom, and these huge citadels dominate the landscape of the major towns and act as the administrative headquarters for their respective regions. Dinner this evening will highlight Asian-Bhutanese cuisine, either at our hotel or one of Thimphu's fine restaurants. This morning a short drive through the countryside surrounding Thimphu brings us to the boundary of Jigme Dorji Wildlife Sanctuary, the largest protected area in the country. The park is home to several endangered species, including the takin, snow leopard, blue sheep, tiger, red panda, and the Himalayan black bear. More than 300 species of birds have also been catalogued within the park. Our walk begins from the small village of Dodena. The trail starts by crossing a covered bridge over the Wang Chhu, and from here we climb steadily to Cheri Goemba, a small monastery perched on the hill with a view of the Thimphu Valley. Shabdrung Ngawang Namgyal built this monastery in 1620, and this is where the first community of monks in Bhutan was established. The monastery is considered very sacred, as it contains the ashes of Tempi Nima, the father of the first Shabdrung of Bhutan, and beautiful frescoes of Buddhist saints. This evening before dinner, we enjoy a Bhutanese cultural teaching delivered by an expert from Thimphu. After an early breakfast we say goodbye to Thimphu and transfer to the Punakha Valley for the next two nights. The road to Punakha offers great views of the eastern Himalayan Mountains as we cross the 10,230' Dochu La pass. Our road then descends through magnificent pine and rhododendron forests and wanders through some of Bhutan's most picturesque countryside. We stop in a small village where a short walk brings us to Chime Lhakang, a temple dedicated to the Lama Drukpa Kunley. Drukpa Kunley is one of Bhutan's favorite saints, and is more commonly known as the 'Divine Madman'. 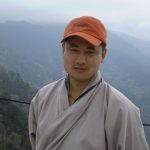 He traveled throughout Bhutan and Tibet using songs, humor, and outrageous behavior to dramatize his teachings, believing that the strictness of the clergy and social conventions were keeping people from learning true Buddhist teachings. This site is still believed to hold fertility powers for women wanting to conceive. Tonight we enjoy dinner at our hotel or a local restaurant. *Estimated based on actual driving times. The total transfer time is longer when taking rest stops, road construction or other unanticipated delays into account. Following breakfast and a drive through the Punakha Valley, we begin our walk by first ascending a series of switchbacks to the modern Khamsum Yuley Namgyel Temple, where we are afforded grand views of the Mo Chu River Valley below. We descend from the temple and follow a well-worn path down the valley through rice fields and small villages. Along the way, we are rewarded with stunning views, the terraced rice paddies providing an exotic backdrop to the river below. After enjoying a picnic lunch alongside the river, we continue our walk to the Punakha Dzong. The Punakha Dzong was the second of Bhutan's Dzongs to be constructed (1637) and for many years it served as the seat of the government. Today it is the home to Bhutan's spiritual leader, Chief Abbot Je Khempo, who resides here with 1,000 monks during the winter months due to Punakha's relatively low altitude by Himalayan standards (4,000'). From this spectacular dzong we can look back to see the Khamsum Yuely Namgyel Temple, perched on the hillside far in the distance. A short walk from the dzong takes us back to the road where we meet our driver. This morning we return by road to Paro, catching another glimpse of the mighty Himalayas as we cross Dochu La pass. Upon our arrival in Paro, we visit Kyichu Lhakhang. Kyichu Lhakhang, meaning twin temples, is believed to have been built in 659 AD by King Songtsen of Tibet, and reflects the introduction of Buddhism to Bhutan. The temple is one of 108 that were built throughout the Himalayas in one day in an effort to subdue a mighty ogress; it is still believed to hold her left foot in place. Finally, we head (either by foot or vehicle, depending on timing) to the valley's magnificent Rinpung Dzong. 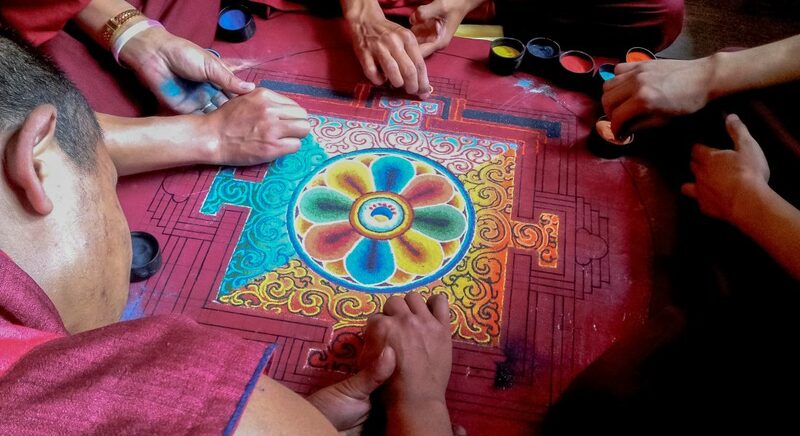 If we are fortunate we may have the opportunity to explore within the dzong's mighty walls. However, if the Administrative Body is in session, we must admire from the outside. Estimated based on actual driving times. The total transfer time is longer when taking rest stops, road construction or other unanticipated delays into account. This morning we enjoy a hike to the famous cliffside hermitage called Taktsang - "Tiger's Nest" - a monastic retreat built into a sheer cliff face high above the Paro Valley. Our hike begins on the valley floor and is a steady uphill climb on a wide hiking trail that switchbacks through pine forests, with glimpses of Tiger's Nest along the way. We pass water-powered prayer wheels and mani stones (sacred stone walls with Buddhist prayers etched into them), as well as a shrine where a high lama was supposedly born - all reminders that this is not just a hike, but a spiritual pilgrimage for many. As we near the monastery, we stop by a small teahouse for snacks and tea and take in our first up-close view of Taktsang. From here our hiking trail levels out for a short while, before we begin climbing down steps and cross a bridge—eventually leading us to this most impressive sacred site. Legend has it that the Tibetan Buddhist saint, Padmasambhava, flew across the Himalayas on the back of a tiger and landed here, bringing Buddhism to Bhutan. Entry into the monastery feels like stepping back in time and we have the chance to visit several shrines that comprise the temple complex. 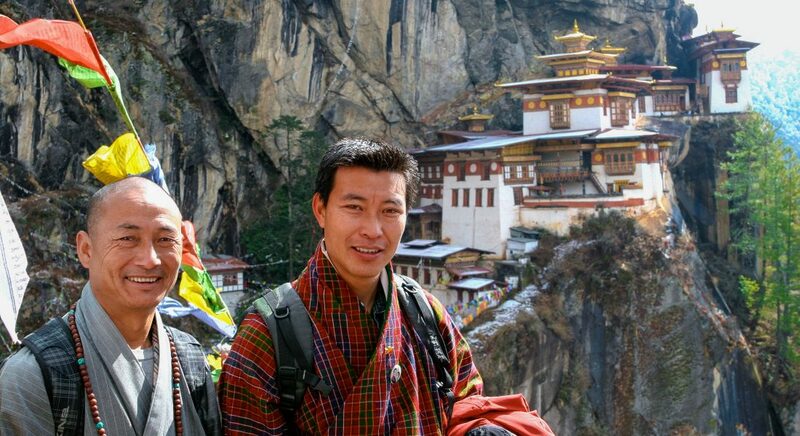 During our exploration, our guide brings Tiger's Nest to life with the tales of Buddhism that make this one of the most famous pilgrimage sites in all of Bhutan. We return to the valley floor, where we enjoy a trail-side picnic lunch before heading back to our hotel. Following some leisure time and independent exploration of the Paro market, we gather together for our final dinner in Bhutan, celebrating our journey through this magical kingdom and the kind welcome that we have received from its generous people. An early morning departure from Paro brings us to Kathmandu, where we begin the second half of our epic journey. Upon landing in Kathmandu, we are met by our guide and then transfer to the domestic airport for our flight to Pokhara (3,080), the rural capital of western Nepal (your guide will have your tickets for this flight). Pokhara is one of the most popular destinations in the country, and for good reason. It is an ideal place to view the snow-capped Annapurna range and the starting point for many trekking expeditions into the mountains. Our evening is spent in comfort at the Temple Tree Resort, whose rooms are filled with ethnic touches evoking the deep cultural heritage of the area. The grounds of the resort include spacious landscaped gardens, a swimming pool, and nearby to Pokhara Lake, with its stunning views of the Annapurna range. 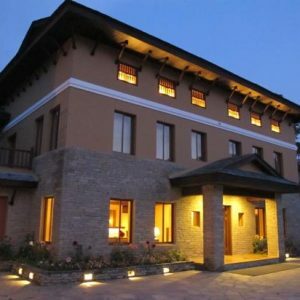 A deluxe hotel located within walking distance from Pokharas bustling lakeside, this boutique property combines distinctive architecture of the region with western standards and amenities. 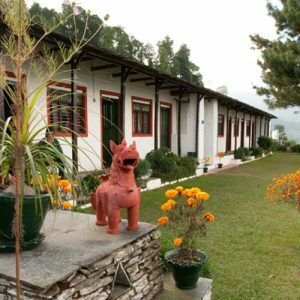 The hotel has a pool, beautiful gardens, and rooms tastefully decorated with Nepali and Tibetan art. Enjoy intimate dining and contemporary cuisine at the Bay Leaf restaurant, or a cocktail at the casual Island Bar. Temple Tree is a great place to pamper yourself either before or after a trek in the mountains. Following a hearty breakfast this morning, we depart with our trekking guide and porters for the starting point of our trek (about one hour driving). Today's hike follows a ridgeline in the lower foothills of the Annapurnas, with surrounding views of the Pokhara Valley. Early this afternoon, we descend into the Modi River valley, our home for the night (3,470'). The lodge has magnificent views of the sacred and still unclimbed Fishtail Mountain, or Machhapuchhre, as it is locally known. 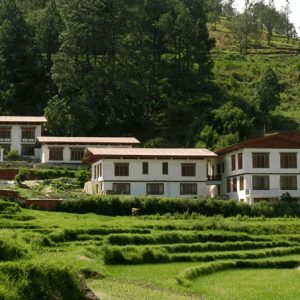 We enjoy lunch at the lodge, followed by an optional walk to the nearby village of Birethanti. Those who prefer can independently explore the river valley surrounding the lodge. The Sanctuary lodge is situated near the tranquil village of Birethanti along the Modi River, offering stunning views of the sacred Fishtail Mountain, Machupuchure, in the distance. The property features 18 simple rooms with ensuite baths and touches of local style. 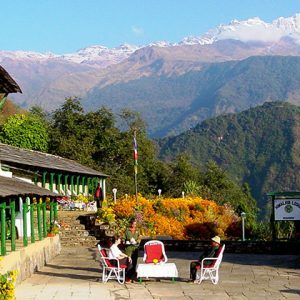 You may unwind on the open grounds over a cup of Nepali tea, or explore the nearby village on foot. After breakfast we leave the lodge, walking through outlying farms following the Modi River valley. Soon we begin to ascend out of the valley and up toward the mountains. We take a relaxing pace, stopping for refreshments en route with spectacular views of the surrounding valleys. Our trail passes through small hamlets, terraced rice fields and sub-tropical forests, offering glimpses of life in the mountains. We arrive at Himalaya Lodge in Ghandruk (6,600') in time for a late lunch, and have time this afternoon to enjoy the magnificent close-up views of the surrounding mountains. Located at the highest point of the tour at approximately 6,600, this former mountain home is perched over the ancient village of Ghandruk. The Annapurna Range is in full view from each of the 11 rooms, which have ensuite baths and are decorated with local cultural motifs. You may explor Ghandruk by foot or ascend the hills above the lodge to see the impressive terraced fields and towering Himalayan peaks above. After enjoying a relaxing breakfast and the glorious views from the Himalaya Lodge, we start our trek to Landruk. En route, we explore the mountain village of Ghandruk, once a major recruitment center for the famous Gurkha soldiers. The women of Ghandruk maintain a local industry of weaving traditional Nepalese rugs. Departing from Ghandruk, the trail descends steeply to the banks of the Modi River. Here, you'll be at the base of the cliffs where the famed honey hunters of Nepal climb on ropes to collect the golden liquid. You'll then cross a suspension bridge to the opposite banks of the Modi, from where it will take us about an hour to trek up a switchback trail (with steps) to reach the village of Landruk. Landruk affords more glorious views of the Annapurna range. We will arrive in time for lunch. Following lunch, you may choose to explore Landruk before settling into to La Bee Lodge and enjoying a well-deserved rest. 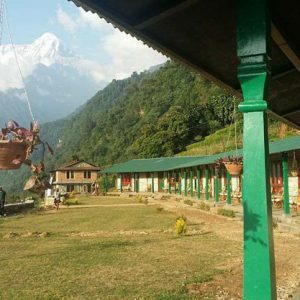 La Bee lodge is the newest lodge in the region, located in Landruk, a typical village of the Gurung community who are known as the famous Gurkha soldiers. 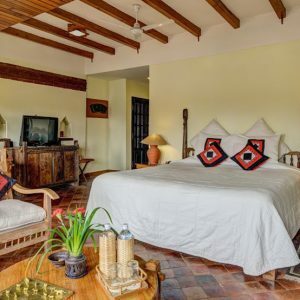 La Bee has 12 rooms featuring local designs and affords glorious views of the Annapurna range. Explore the nearby cliffs dramatically rising from the Modi River, also known for the famed honey hunters of Nepal. This morning our trail enters a sub-tropical forest full of magnificent flora, including tree orchids, rhododendrons and magnolias. After approximately an hour, we arrive at the village of Tolka. We then ascend to a ridge, passing through the village of Pothana, where Tibetan traders live and sell their souvenirs. We arrive at Basanta Lodge, our home for the night, in time for lunch. 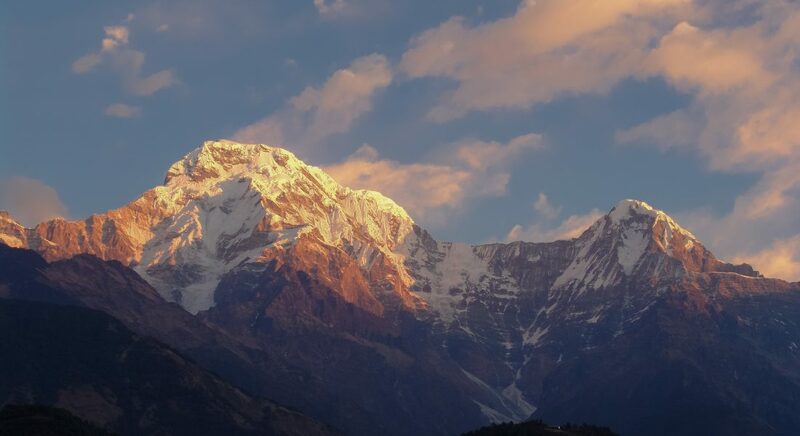 Later this afternoon, we have the option to hike to the old village of Dhampus (4,920'), or to remain at the lodge, where sweeping views of the entire Annapurna Range are ours to enjoy. This simple lodge is perched on a ridge overlooking the beautiful Phedi and Mardi Valleys and the span of the Annapurna range to the north. The property features 8 rooms with ensuite baths, providing a comfortable respite after trekking. From the lodge you may explore the old village of Dhampus, or simply relax and soak in the tranquility of its location. The trekking portion of our journey ends this morning, as we depart along the ridge, descending through wooded hillsides and terraced farmland to the valley floor. It is here that we meet our vehicle for the drive to Pokhara, and our flight to Kathmandu. 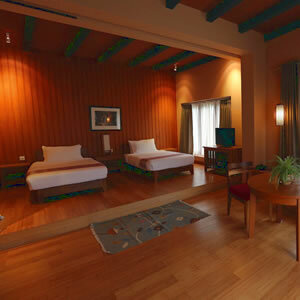 Upon arriving in Kathmandu, we are transferred to the five-star Dwarika's Heritage Hotel. This afternoon we have the option to venture to Patan Durbar Square, Boundanath Stuppa or Pashupatinath temple, each significant sites for Buddhists and Hindus residing in the city. 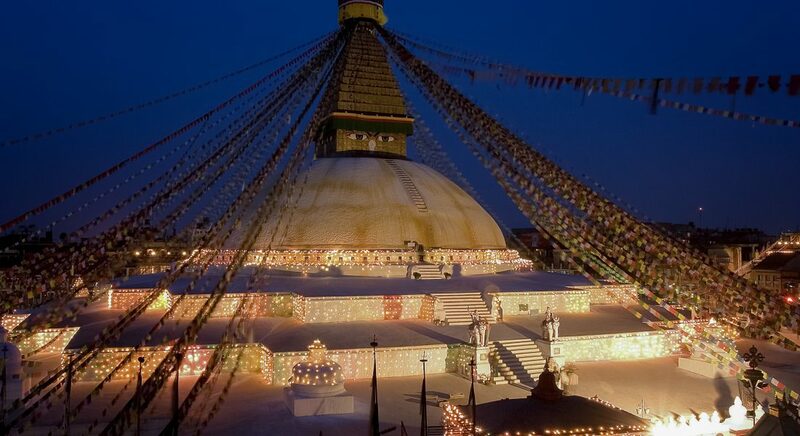 We will conclude our day enjoying a celebratory dinner at a favorite restaurant in Thamel or at one of Dwarika's world-renowned restaurants, bidding a final farewell to Nepal. After an early morning breakfast, we have the opportunity to experience one of the most spectacular mountain flights in the world. An optional flight (not included in cost) departs Kathmandu and flies east along the Himalayas, giving us eye-level views of the highest peaks on earth, including Mt. Everest. After the flight, we return to the hotel where we say goodbye before continuing to the airport for our homeward journey. Druk Air, the National Airline of Bhutan does not typically release their flight schedules until a few months prior to departures. 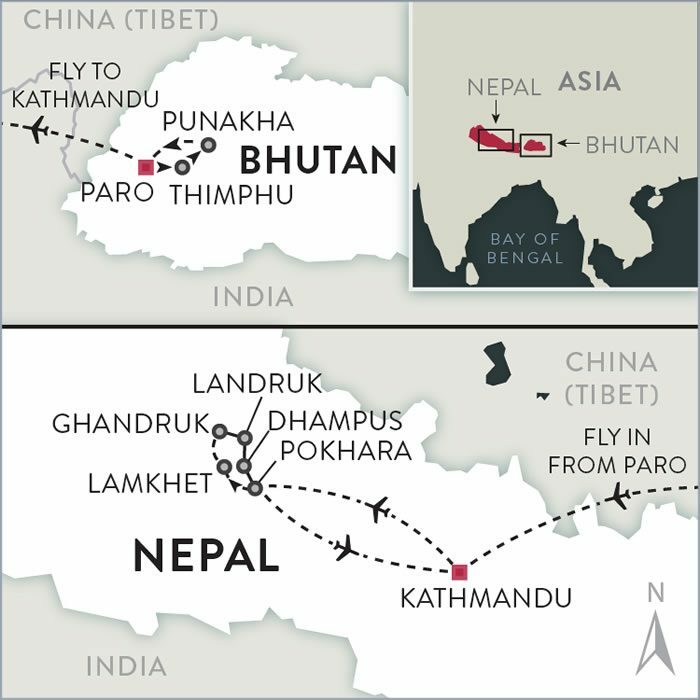 Our dates have been set to coincide with the historical schedule for the flights from Bhutan to Nepal. While we do not anticipate any change to this schedule from year to year, it does occasionally occur. In the event that the schedule changes in such a way to affect our itinerary, we will adjust our trip accordingly. The first and last days of the trip will remain the same; however, it will most likely mean that we will be required to stay either one more or less day in Bhutan. Boundless Journeys' trips are designed for energetic and flexible individuals who like to be active and have a spirit of adventure and a positive attitude. Himalayan Kingdoms Hiking is rated 3, moderate, on a scale of 1-5 (with 5 being the most strenuous). The walks and hikes for the first part of this trip are easy to moderate day hikes, generally from 2-5 hours in length with minimal vehicle support. During the Nepal trekking portion of the trip (days 8-12), hikes are from 3-6 hours in length with no vehicle support. Elevation gains and losses vary from approximately 500'-3,000' in one day. A few days involve long drives on narrow, winding roads. Your Boundless Journeys guide will meet you at the Paro, Bhutan airport upon the arrival of your flight from Bangkok (other regional airports upon request). Please be sure to be at the Druk Air (national airline of Bhutan) check-in counter at the Bangkok International Airport 2-3 hours before your scheduled flight on Day 1 of our trip. The airline tickets for your flight from Bangkok to Bhutan will be purchased for you in advance by Boundless Journeys. Kathmandu airport on the final morning, after breakfast. You can book your return flight anytime on this day, allowing for time to arrive at the airport 2-3 hours in advance of your flight. If you are taking the Everest scenic flight, then you will need to book your flight home after 2pm. Our trekking route is moderate and we follow a leisurely pace. 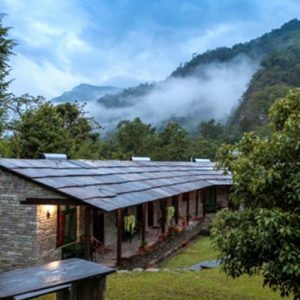 The route in the foothills of the Annapurnas is carefully planned to take advantage of amazing mountain scenery and charming lodges. Each morning after breakfast we set out at about 8:30 a.m., stopping mid-morning for tea, and then continuing on until our midday stop for lunch. The trails are generally in good condition and many are made from inlaid stones, including steep steps at times. Time spent on the trail will average 3-6 hours per day, with plenty of time to stop along the way. Porters will carry our luggage, and all you need to carry is a daypack with extra layers, your camera, water, and lunch. Bhutan and Nepal are generally delightful for hiking in the spring and fall. The driest weather and clearest skies are typically in October and November. Beautiful flowers are in bloom, and you will encounter fewer travelers in the months of March and April. Our trip begins in Thimphu, which is situated at 7,500 feet, in the foothills of the Himalayas. After our first two nights here we move to the Punakha Valley, which offers a relatively low elevation of approximately 4,300 feet. Our third hotel, in Paro is at approximately 7,300 feet. 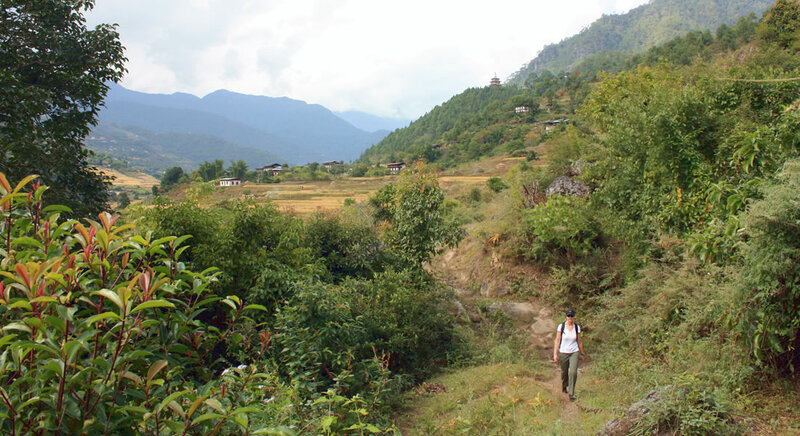 Our walks and hikes in Bhutan will take place at elevations from 4,300 feet to approximately 10,000 feet. There is time to move at a comfortable pace, allowing ourselves to adjust to the mountain air. Keeping well hydrated, avoiding excessive alcohol, eating frequent, light meals, and getting plenty of rest will help with any effects of altitude that you may feel. In spite of being among the highest peaks in the world, we will not be trekking at a high elevation, and the elevations you will experience on this trip are not extreme. Kathmandu is at 4,500', Pokhara about 3,080', and during the trek elevations will range from 3,000' to 6,600'. 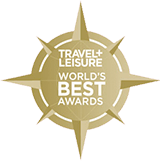 Accommodations include standard hotels in Bhutan, deluxe hotels in Kathmandu and Pokhara, and privately run lodges on the Annapurna trek. All with private baths. We have done our best to select well-located properties that reflect the character and culture of each region. 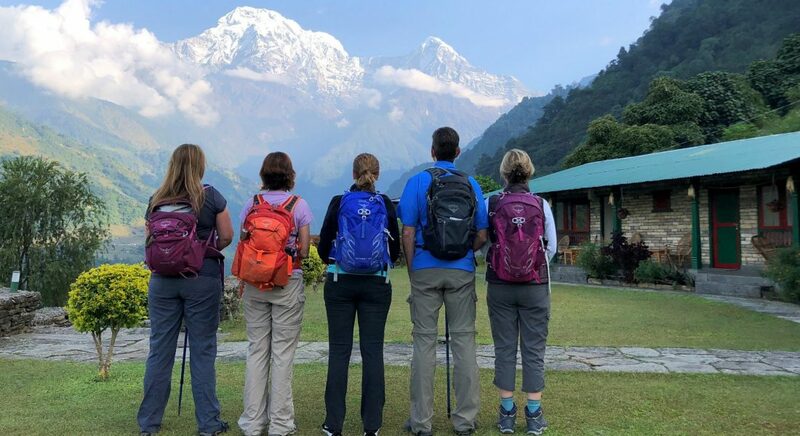 We stay at deluxe hotels in Kathmandu and Pokhara and during the trekking portion of our trip we are in mountain lodges, which are the very best accommodations on the Annapurna circuit. The lodges are simple and rustic, but fit well with the environment. They have private bathrooms, two twin beds in each room (which can be pushed together upon request), and electricity. 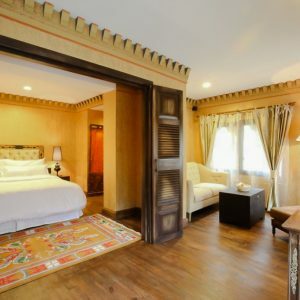 Accommodations in Bhutan are somewhat basic and this itinerary includes a cobmination of the standard and deluxe hotel options available in Bhutan. Although the hotels in Bhutan cannot be compared to international standards, they are comfortable and offer all necessary facilities. We believe that any inconveniences due to these modest accommodations are far outweighed by the unforgettable experience of visiting Bhutan. *If you prefer to stay in luxury hotels in Bhutan, please contact us to discuss a private journey. Confirming hotels in Bhutan: Due to the unique tourism policy in Bhutan, we are unable to confirm which hotels we will be using until four weeks prior to departure. The accommodations listed will most likely be what we can expect, but may alter due to availability. It is important to reserve your trip early, as the airlines going into Bhutan will only accept reservations with the full payment of the ticket. Therefore we are unable to hold group seats in advance of reservations. Seats can only be confirmed upon receipt of your deposit, as well as the payment of $725 for these flights. Please contact our office with any questions regarding these important policies. important to embrace what you see and experience without judgment and recognize that Bhutan, just as any country, is struggling to be a part of this complex and rapidly changing world. We are confident that with this attitude, the Bhutan you experience will be a fascinating and memorable place. Bhutanese and Nepali dishes borrow elements of Indian and Chinese cuisine, however they are also unique. One of the most distinguishing features of Bhutanese cuisine is the ubiquitous chili. Ema datse, a dish made with chilis and cheese, is a spicy favorite. Some excellent non-spicy options include kewa datse (potatoes and cheese sauce), and shamu datse (mushrooms with cheese sauce). Bhutanese and Nepalese also love momos. Though a Tibetan specialty, these dumplings now occupy a permanent place in Himalayan cuisine. Chicken or pork momos are favored, but cheese momos are most common. Another important feature of this exotic cuisine is the use of rice, found in various forms in dishes ranging from breakfast to dinner. We do our best to offer a la carte meals at unique local establishments, however, options are quite limited in the smaller towns, so many of the meals will be served buffet-style at our hotels. While we do our best to offer our guests the best possible meals and food available in the areas we travel, it is important to know that the food there is basic and does not offer the variety and quality that we may be accustomed to at home. Please travel to Bhutan and Nepal with an open mind and do not have high expectations in this regard and you will not be disappointed. Vegetarians can easily be accommodated with advance notice. Madhav’s family and forefathers are from the hills surrounding the Kathmandu Valley. 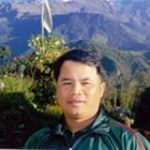 After completing his initial schooling, he began leading treks and has worked his way up to guiding in the spectacular Annapurna region. 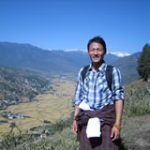 Madhav has traveled extensively in his beloved country of Nepal and enjoys sharing his knowledge and culture with guests. He is quick to assess and respond to the needs and dynamics of groups and has a knack for spotting wildlife. Madhav’s friendly attitude, attention to organization, prioritization of safety, and wealth of local information make him not only a spectacular guide, but also a great traveling companion. Easy to moderate day hikes, 3-5 hours per day; moderate trekking, 3-6 hours per day; average trekking elevation is 5,000-6,000 feet.